Once again this year, a Nobel Prize in Physics was awarded to scientists who dedicate their research to the subject of light. The prize recognizes the progress made in the field of laser research and the practical application of laser light as a groundbreaking achievement for our society. On December 10, the day the Nobel Prizes are awarded in Stockholm, two scientists from the Faculties of Natural Sciences and Mechanical Engineering of the University of Paderborn, Prof. Dr. Thomas Zentgraf (Center for Optoelectronics and Photonics Paderborn, CeOPP) and Prof. Dr.-Ing.Hans-Joachim Schmid (Direct Manufacturing Research Center, DMRC) will explain the significance of the research results of this year's three Nobel Prize winners and show how laser light has found its way into applications of our daily lives. 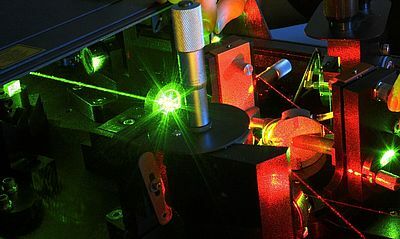 Many know lasers from science fiction and action films, where they create spectacular effects. "Although it is not yet possible to build a laser sword like in the Star Wars films, lasers make many tasks easier for us today, especially in material processing and measurement technology", explains Prof. Zentgraf. The interested public will be presented with information about the prize winners, the physical basis of the inventions and their significance for our society. The evening lecture will take place on Dec 10, 6 p.m. in the lecture hall L2 on the campus of the University of Paderborn. Half of the 2018 Nobel Prize in Physics was awarded to the physicist Arthur Ashkin "for the development of optical tweezers and their application in biology" and the other half was awarded jointly to Gérard Mourou and Donna Strickland "for the development of a method with which high-energy, ultra-short optical pulses can be generated". 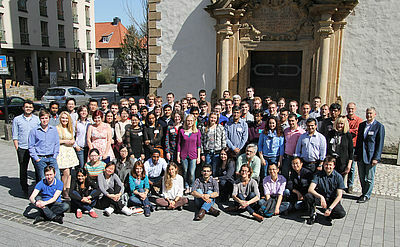 Prof. Dr. Thomas Zentgraf is head of the working group "Ultrafast Nanophotonics" at the Department of Physics. Prof. Dr.-Ing. Hans-Joachim Schmid is head of the "Chair of Particle Process Engineering" at the Faculty of Mechanical Engineering. On November 30th 2016, Professor Shuji Nakamura, laureate of the Nobel prize for Physics in 2014, is giving a special lecture at the University of Paderborn. In 2014 Professor Shuji Nakamura received the Nobel Prize together with Prof. Isamu Akasaki and Prof. Hiroshi Amano for the invention of high efficient blue LEDs. The three researchers engineered high-quality Gallium Nitride as a material for blue light emitting diodes, which are also the basis for white LEDs. Professor Nakamura studied Electrical Engineering in Japan. Since 1999 he is Professor at the University of California Santa Barbara. In 2008, Prof. Nakamura, along with his collegues Prof. Dr. Steven DenBaars and Prof. Dr. James Speck, founded the company Soraa, which produces and markets high-end LEDs. Date/Time: November 30th, 2016, 6 p.m.
November, 19th 2015, 6 p.m.
With the help of various examples from research and application this question will be lightened during this evening.